Capitol Hill is one of the most prestigious addresses in Washington DC located in the Southeast and Northeast quadrants. Gentrification efforts have transformed the neighborhood into an upscale enclave. City-watchers estimate that one-third of the members of Congress make their home in Capitol Hill when Congress is in session. Boundaries run from the Capitol precinct to the west, F Street to the north, 13th and 14th streets to the east and the southeast Freeway to the south. An expansion area runs south of the Southeast Freeway bounded by 7th, M, 10th, and 11th streets. Transportation options include the Union Station, Capitol South, Eastern Market, and Potomac Metro stations. Read more about Capitol Hill real estate. 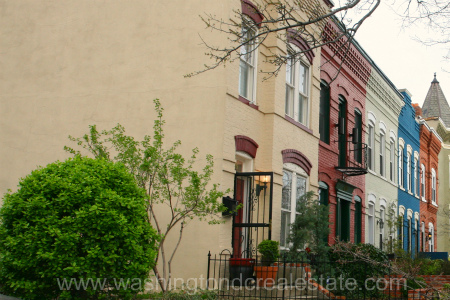 Capitol Hill is also the oldest and largest residential historic area featuring an eclectic mix of row houses of different styles and architecture. Ornate Italian models exist next to early 19th century manor houses and federal townhouses. On some streets the late 19th century press brick row houses dominate, many of which are adorned with decorative elements combining Richardsonian and Queen Anne motifs. Historic landmarks include not only the United States Capitol building set atop a hill overlooking the the National Mall, but also the Senate and House office buildings, the Library of Congress, the Supreme Court building, and Marine Barracks. Pennsylvania Avenue is the main non-residential corridor of the neighborhood and the "go-to" place for residents for shopping, dining, and entertainment. Another popular destination is Eastern Market -- the oldest working public market in DC, where merchants sell fresh meat and produce.